Commentary: Today, at a press conference and in a speech on the Senate floor, U.S. Senator Tom Udall and other Senate Democrats called for a vote on their "We the People Act" and Udall's constitutional amendment to break the control of special interests, such as the NRA, on elections and congressional Republicans. The move follows Senate Republicans' blockade this week of commonsense legislation to keep guns out of the hands of suspected terrorists and expand background checks for all gun sales, and the refusal by House Republicans to hold a vote on the measures. 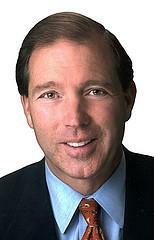 Udall is leading the We the People reform effort, which was first unveiled earlier this month. It would take dark money out of elections, amend the Constitution to allow Congress to rein in unlimited campaign spending, and empower a new agency to vigilantly enforce campaign finance laws. According to the Center for Responsive Politics, the NRA’s unlimited political spending funded by contributions from corporations and special interests – like the Koch Brothers – has tripled since the Citizens United Supreme Court decision. In 2014 alone, experts estimate that the NRA spent at least $31.4 million on the midterm election. After the press conference today, Udall joined a majority of senators in voting to move forward on compromise legislation by U.S. Sens. Susan Collins (R-Maine) and Martin Heinrich (D-N.M.) to close the terror loophole and prevent people on two federal terror watch lists from buying firearms. The measure survived — on a 46-52 vote — a motion that effectively would have killed it. But the compromise still requires an additional vote to determine whether it can advance, so it remains in limbo. "Today's vote shows that the majority in the Senate supports the action that New Mexicans and people across the country are crying out for to prevent gun violence. But so far, we haven't been able to get it done because of the influence of a few powerful special interest groups," Udall said. "Ever since the Supreme Court put a 'for sale' sign on our elections with the Citizens United ruling, special interest spending has skyrocketed. And those big money groups are bullying our colleagues on the other side of the aisle into blocking reasonable steps to close dangerous loopholes in our laws. We need to pass the We the People legislation and my constitutional amendment to overturn Citizens United to end the stranglehold such special interests have over Congress." At today's press conference, Udall was joined by We The People Act cosponsors, U.S. Sens. Charles Schumer (D-N.Y.), Sheldon Whitehouse (D-R.I.), and Jeff Merkley (D-Ore.). Prior to the press conference, Udall delivered a speech on the Senate floor highlighting the importance of the We the People reform package to increase transparency, rein in special interest control over elections and return democracy to the American people. The We the People reform package includes a constitutional amendment to stop wealthy special interests from making unlimited campaign contributions, make government more accountable through campaign disclosure and transparency, strengthen the lobbying laws to limit special interest influence in Congress, and close the financial services industry’s revolving door.